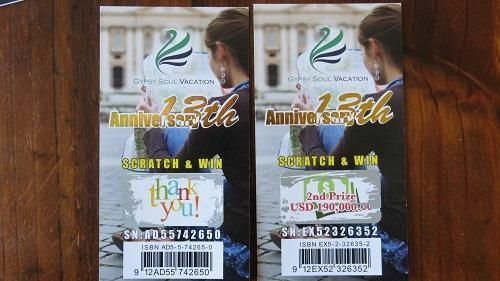 This Scam is one of the better looking ones, they supply a Nice Professional looking Brochure, plus Two Scratch and Win Tickets in the envelope. BUT BEWARE, its from a fake company based in Malaysia. They are only interested in Getting YOUR MONEY from your supposed scratch winning ticket. To make this scam look a bit more authentic they include a dud ticket along with a major prize, to try and get you convinced you are a winner. Image above showing tickets. Now Really who is going to think they one money from some random ticket sent to their home address, from some unknown company you have never dealt with in your life???? UNFORTUNATELY There are some Gullible people out there and they will loose their money, otherwise these type of expensive scams would not exist.